We've launched a new map as part of a partnership with the Jefferson County PVA. We've put all of their property values on an interactive map that is embedded on their site. There is also a version on our Metro Mapper site. It's a perfect example of working with existing government data, and creating an interactive map for the government agency's site. It's going to keep people coming back to their site, and gain a whole new following of people that find the Metro Mapper site then see the property value map. I think it’s really going to improve the way people search for information, and raise everyone’s expectations for what the government should be providing to citizens. Jefferson County Property Valuation Administrator, Tony Lindauer, announced today another enhancement to the PVA award winning website. 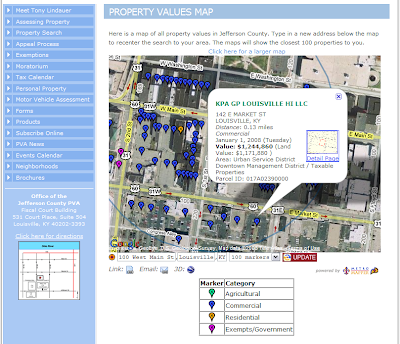 All property parcel values across Jefferson County will be viewable on a free interactive map. The new service supplements the existing address search, since it allows citizens to see the property values around them at-a-glance without having to know the neighboring street names. A citizen can enter any address or street and see the closest parcels. A marker for each parcel will show a popup with useful information, including the property and land value, owner name, date assessed, parcel thumbnail, and type of property. The popup will include a link to the subscription web service, which gives even more detailed information on property. The new service will be available on Monday, October 27, 2008. Lindauer said the interactive maps, similar to Google Maps, will be more user friendly in accessing snapshot information for each parcel. To facilitate the data exchange, the PVA is using the open data format called the OMG Standard.